Parts of my juniper tree are turning brown. When I look closely I see there are many small cocoons hanging from underneath the branches. What's damaging my tree? Walk through your landscape this month, and you may spot small, tan, oval-shaped, cocoon-like structures hanging down from your plant's branches. A closer inspection of the plant might also show that some of the leaves have been eaten away. What are these things, and what's damaging your plant? The answer is bagworms. 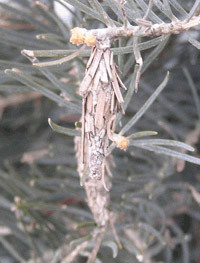 The bagworm is an insect native to the United States and is common in eastern Nebraska. Bagworms feed on many species of trees and shrubs, but are most common on evergreen trees and shrubs. 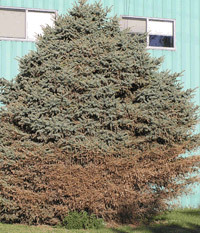 Juniper, arborvitae, pine, and spruce may be killed if completely defoliated and less severe attacks can slow growth. Bagworms also feed on shade, orchard, and forest trees of nearly every kind, as well as many ornamental shrubs and perennials, however, severe attacks are unusual. Since deciduous plants regrow new leaves each year, the defoliation caused by bagworm feeding is usually not serious. The growth of small or newly planted trees, however, could be slowed by leaf feeding. The adult male bagworm is a small, furry gray moth with clear wings; the adult female does not have wings and never leaves the bag she constructs during feeding. The larva is a brown or tan caterpillar with black markings. Bagworms overwinter in the egg stage inside the female bags, which are fastened to twigs. There may be as many as 300-1000 eggs in a single bag. Since the female bagworm cannot fly, local populations can build up to damaging levels as succeeding generations of insects emerge. Eggs hatch in late May and early June, and larvae feed until late August or early September. There is one generation per year. After hatching, the larvae emerge from a hole at the base of the mother's bag and spin down a strand of silk. The tiny insect is often ballooned by the wind to nearby branches or plants. Once a suitable host is found the new insect immediately begins to form a new bag over its body. Initially the young insect's bag is about 1/8 inch long, but at maturity will grow up to 2 inches long. By mid-August the mature larvae attach their bag to a branch with a strong band of silk and begin to pupate. Adult males emerge in September. How can bagworms be controlled? Hand-picking is the best way to control light infestations on small plants during the dormant season. Be sure to remove the bags before eggs begin to hatch next May. Destroy bags by burning, immersing in kerosene or by crushing. If bags containing larvae are discarded on the ground, the larvae may return to the host plants. Plan to apply insecticides to control next year's small larvae in late June. Bacillus thuringiensis, BT, is available at nurseries and garden centers as Dipel, or Thuricide. Other insecticides currently labeled for bagworm control include acephate, carbaryl, cyfluthrin, malathion and permethrin. Affected plants must be thoroughly covered with the insecticide so that it is ingested by the insects as they feed. Feeding by mature caterpillars slows in August before pupation into the adults, so chemical control in late summer and fall may not be effective. 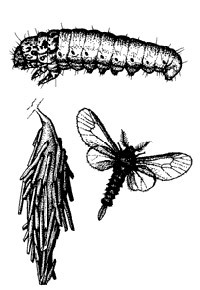 Bagworm caterpillar (top), adult make bagworm (right), and bagworms in bag (left). If homeowers don't see any bagworms on their evergreen trees, but know that trees in the neighborhood are affected how many times they should spray their trees and with what if they don't see them. Good question, if you don't see them, don't spray. But if they're in the neighborhood, and if you see them on spruce and juniper trees around the neighborhood you should keep a close eye on your plants. When the eggs hatch in mid May or June the caterpillars shoot a long string of silk, then they blown across the landscape. That's how your trees could become infested. If there's a lot of bagworm activity in the neighborhood, your plants are at high risk for bagworms. Go out, look, and if you see them, you want to treat them before they're 1/2 inch in length, with Bacillus thurengiensis (Dipel), or bifenthrin. Later in the summer if you see larger, 1-1 1/2 inch bags then pick them off and dump them into a soapy water.